Super Zepp SW Antenna-The Super Zepp SW Antenna is an easy to install antenna that works with almost any radio in almost any situation! Sony, Realistic, Sangean, Drake, Icom or Grundig, it really doesn't matter, because all these great brands of radios work equally well with the Super Zepp Antenna. The antenna is a full quarter wave in length on 49 Meters. Each antenna is cut, tuned and tested with the MFJ Antenna Anlyzer to be resonant on the design frequency. It works great on all frequencies, 49 meters and above, because it works as multiples of a quarter wavelengths on the higher frequencies. It operates as a half wave antenna on 22-25 Meter band, etc. if you live in an apartment and can’t put up a permanent outside antenna to surf the shortwaves , the Super Zepp Shortwave Antenna will improve your reception!SW listeners can deploy the Super Zepp by stretching it out on the floor, hiding it under the rug, attaching it to the baseboard of house or apartment, thumb tack it to the wall or ceiling, hiding it behind furniture, dropping it out the window vertically, stretching it out the window to a nearby tree or pole and tying off the end!!! In most cases it will make an awesome difference in the quality of your reception over the little telescoping rod antenna that comes with most shortwave radios today! Previous buyers report as much as 3 to 4 S-Units improvement in signal strength over the rod antenna on their shortwave radios! One buyer reported having to turn down his RF Gain on his radio for the first time ever! A nice problem to have. The Super Zepp Shortwave Antenna is based on an antenna design, the End Fed Zepp, that early pioneers of radio used because it worked so well. The design was adapted to shortwave listening uses by an experienced ham radio operator of over 42 years! The main advantage of this antenna is that it can be used on a multitude of shortwave bands. It is measured and cut to specific length to maximize reception on the shortwave bands you enjoy the most! Constructed of the highest grade of antenna wire available, stranded tinned copper for best reception and conductivity, this antenna is safe to use and should perform well for everyone! The antenna wire is covered with high quality plastic insulation, one the best insulators in the world! Color may vary. Instructions come with the antenna on how to install the Super Zepp best for your situation, whether you live in an apartment or can actually install the Super Zepp outside for maximum performance! 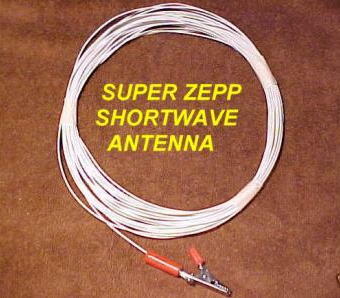 The Super Zepp Shortwave Antenna is a NO HASSLE ANTENNA! It comes with a simple alligator clip on the end to attach right to the telescoping rod that almost every newer shortwave radio has built in it. NO SPECIAL PLUGS, LUGS OR CONNECTORS NEEDED! Older, vintage radios with screw terminals for the antenna with find the Super Zepp is easy to use as well. Just clip it on the antenna terminal and open up a whole new world of radio signals that just weren't there before! Here's a photo that shows how quick and simple it is to use the Super Zepp.